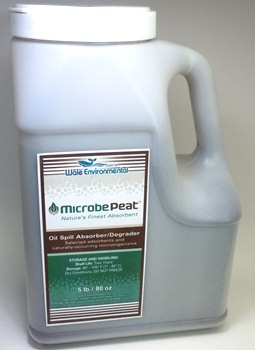 1 lb of MicrobePeat absorbs 1 Gallon of oil! Fully biodegradable, made from 100% biodegradable components. View full details below, or download our flyer! MicrobePeat™ is a synergistic blend of specialized oil absorbers along with naturally occurring, preselected, adapted microorganisms and nutrients. MicrobePeat™ absorbs oil while floating on a liquid surface, and contains only biodegradable components. It is specifically formulated for use on spillage of oil and other forms of contamination by petroleum hydrocarbons and related wastes. MicrobePeat™ is effective on crude petroleum, gasoline, diesel fuel, machining oils, hydraulic fluids, solvents, monomers, and other petroleum derivatives. MicrobePeat is an all natural, biodegradable, green product formulated specifically to absorb, encapsulate, and degrade/remediate petroleum based products, replacing the need for clay based absorbents. MicrobePeat can be used on both land and fresh water surfaces. Encapsulates the spill and the microbes will convert the absorbed oil to carbon dioxide and water. Specifically formulated to degrade petroleum based products. Can be used in most commercial and industrial environments. Less material to dispose of (1 lb. of MicrobePeat picks up 1 U.S. gallon of oil) and will pass T.C.L.B. for landfills. Naturally reduces hydrocarbon odors and suppresses flammable vapors. Picks up hydrocarbons on water as well as on land. MicrobePeat™ is applied directly to the spill to contain and then degrade the absorbed oils. When used on oily and chemical mixtures, it cleans up your spill at nominal cost. MicrobePeat™ can absorb and break down a broad range of wastes from petroleum recovery, transportation, storage, and refining, steel making, metal forming, textile, hydrocarbon, and chemical processing. It is especially effective in spills on water; but it’s ingredients are 100% compatible with soil applications. In general, MicrobePeat™ is applied directly to the spillage to absorb and contain the spill. Contact Us for additional information. Note: Consult local, state and/or federal laws for proper disposal of absorbed oil. It is the user’s responsibility to determine if absorbed material is hazardous. MicrobePeat™ contains no hazardous materials and presents no environmental hazards when used as directed. For full details, storage & handling and more, Download the MicrobePeat flyer.